Coronary artery disease (CAD) and peripheral artery disease (PAD) are diseases of atherosclerosis that have enormous clinical and economic burden in the United States. Adherence to a long-term exercise program is one of the most efficacious treatments for these patient populations. A consistent exercise regimen can help control or improve several risk factors, including fitness, insulin sensitivity, body composition, stress management, low HDL levels, hypertension, vagal tone, and inflammatory markers. Functional capacity (peak VO2) is also very highly related to morbidity and mortality in cardiovascular disease populations. However, due to a lack of supervision, understanding of importance, and motivation, patients have low adherence rates for unsupervised home exercise. For these reasons, there is a need for innovative models to increase physical activity in these populations. Although diverse in design and content, home-based mobile health (mHealth) continues to gain traction as an alternative or supplement to site-based cardiac rehabilitation. Mobile health strategies that leverage smartphones, health coaching, and wearable devices to collect patient-generated data is one such strategy that may improve long-term care in these populations. These interventions can remotely monitor a patient’s risk factors and provide patient support without requiring a site visit. Two recent small, randomized control trials by Duke investigators, described below, show the potential of mHealth for future care management in two different disease populations. The first study utilized smartphones, a Fitbit physical activity tracker, and remote health coaching in a group of patients finishing site-based cardiac rehabilitation. Because it is known that when participation in a cardiac rehabilitation program ceases, adherence to health recommendations often start to decline, the purpose of this pilot study was to evaluate if a 12-week mHealth program could sustain the fitness and physical activity levels gained during cardiac rehabilitation. Mobile health patients were given an exercise prescription based on steps per day that was slightly above what they were achieving during cardiac rehabilitation. Results (Figure 1A) showed higher peak VO2 (the gold standard for measuring fitness) and an increase in moderate-high physical activity in the mHealth group compared to a usual care group 12 weeks after completing site-based cardiac rehabilitation. Fig. 1A: Group changes in fitness and activity level. Reprinted with permission from: https://doi.org/10.1016/j.amjcard.2018.05.018. 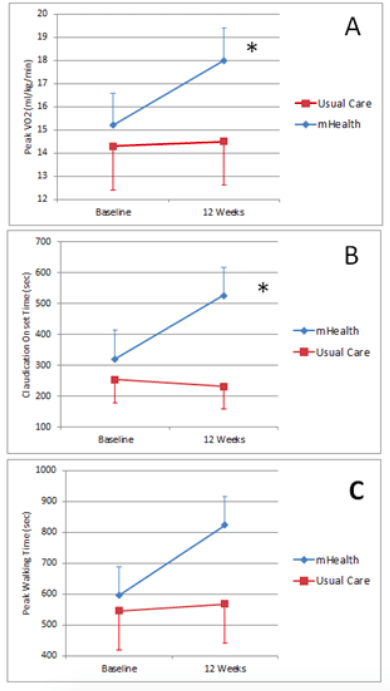 Furthermore, mHealth patients maintained the Center for Disease Control physical activity guidelines of 150 minutes/week, while the usual care patients fell below the recommended minutes per week (Figure 1B). 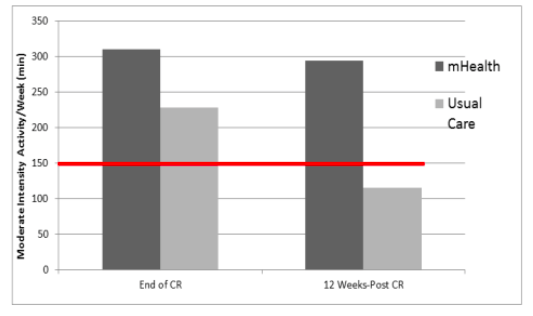 These findings are published in the article: Effects of a 12-week mHealth program on peak VO2 and physical activity patterns after completing cardiac rehabilitation: A randomized controlled trial. Duscha BD, Piner LW, Patel MP, Craig KP, Brady M, McGarrah RW 3rd, Chen C, Kraus WE. Am Heart J. 2018 May; 199:105-114. Fig 1B: Minutes of Moderate Intensity Activity relative to CDC guidelines (red line). Reprinted with permission from: https://doi.org/10.1016/j.amjcard.2018.05.018. In a second study, PAD patients limited by intermittent claudication were also provided a Fitbit physical activity tracker and a smartphone (provided by Verizon if the patient did not own a smartphone). Intermittent claudication is the most common symptomatic manifestation of PAD and decreases the ability to walk and quality of life over time. Similar to the first study, mHealth patients were given a daily step prescription slightly above their baseline average. In addition, disease-specific education was provided on their smartphone and health tips were emailed to them weekly. Study results demonstrated efficacy for using mHealth by significantly higher peak VO2, delaying the time to claudication and improved peak walking time (Figure 2) after 12 weeks in the mHealth group. These two studies show promise for mHealth interventions to promote home-based exercise and improve functional capacity in cardiovascular disease populations. 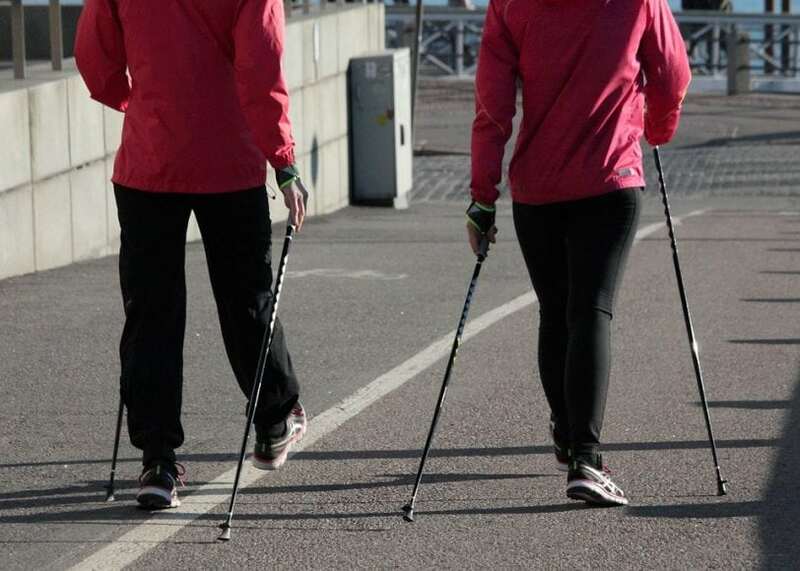 These types of interventions are particularly relevant for those patients who cannot attend site-based rehabilitation programs or need long-term remote monitoring. Fig. 2: Group changes for peak VO2 (panel A), claudication onset time (panel B), and peak walking time (panel C) from baseline to 12 weeks (* indicates differences between the group for change score; p < 0.05). Reprinted with permission from: https://doi.org/10.1016/j.amjcard.2018.05.018. The findings from the mHealth PAD study will soon be published (September 2018) in an article entitled Effects of a 12-Week mHealth Program on Functional Capacity and Physical Activity in Patients with Peripheral Artery Disease in the American Journal of Cardiology. This work was conducted by Brian D. Duscha, Lucy W. Piner, Mahesh P. Patel, Lawrence E. Crawford, William S. Jones, Manesh R. Patel, and William E. Kraus from Duke University School of Medicine. Brian Duscha is a cardio-health and physiology researcher at Duke University Medical Center | DUMC · Division of Cardiology.